Plantation Old Fashioned Clear Candy is a subtle sugar candy that has delighted many for decades. Each candy is shaped into a classic Christmas toy and comes in a variety of beautiful colors. The only downside is that the candy is very delicate, so they do break easily. Even if they are broken, they are still delicious to eat. Washburn Cut Rock Hard Candy is just as delicious to eat as it is neat to look at. Each candy has designs and vibrant colors that make it great for gifting and decorating. This bag has 9oz of this classic candy, but you still want to buy two bags; this candy will go quickly! Following the trend of unique, retro Christmas candy, this box of Ribbon Candy will amaze those new to nostalgic candy. This treat isn’t seen as often, but it will be a clear favorite among those who try it. Each box has assorted colors and flavors, so it probably wouldn’t hurt to buy a few boxes to make sure you get to try all of the flavors. Also, these make a great Christmas gift for those who love candy. 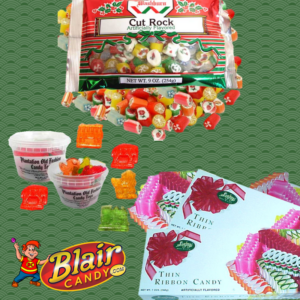 Check out these and other nostalgic Christmas candy treats by visiting BlairCandy.com!